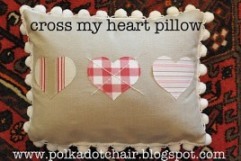 An argyle motif does double-duty as a Valentine’s theme in this Cross My Heart pillow by Melissa from The Polka Dot Chair and May & Mae. She shares a tutorial on her blog. Get the how-to.